A house from the 1880s that's narrow, small, and in terrible shape: is this the place for a great modern interior? In the hands of Toronto architect Heather Dubbeldam, it turned out to be exactly that. Her client, doctor Yash Patel, had a green agenda and a commitment to contemporary design. "I wanted it to be small; energy-efficient; and beyond that I let Heather and her associates figure it out," he says. "I let them run." Dubbeldam used a variety of strategies to keep it green (the tiny utility bills prove this), but also created remarkably rich spaces and textures in this small house and equally tight yard. Her remodel of the house kept its 1,450 square feet of interior space, but carved it into an open plan, and established strong visual connections between the house and the yard. Now both zones flow into each other—limestone, ceramics, cedar boards, and a row of beech trees all working together in subtle harmony. 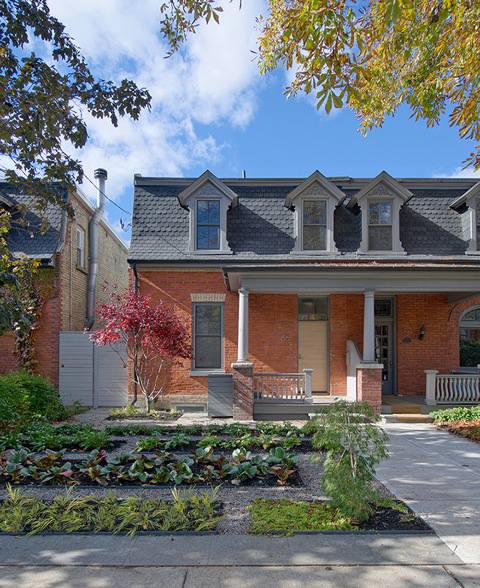 Toronto doctor Yash Patel's home is an 1880 house on a quiet block in The Annex, a 19th-century downtown district. "This is a very pedestrian-friendly neighbourhood, and that’s important to me," he says. A modern garden by architect Heather Dubbeldam hints at what's inside. Dubbeldam opened up the layout completely—long linear elements draw your eyes through the house to the backyard, and subtle details guide your eye there. One type of porcelain tiles, intended for outdoor use, stretches from the kitchen to the yard. "The backyard is small," she says, "but when you connect the house and the yard visually, they both seem so much larger." A custom unit of sapele wood holds three masks that evoke Patel's East African heritage. Dubbeldam designed the built-in dining table out of solid sapele. The backsplash and counter are made of gray St. Marks limestone. The hearth—lined with panels of industrial felt by artist Kathryn Walter of FELT Studio—is Patel’s favourite part of the house. "It's modelled after 1950s and 1960s modernism, when people had stone walls that looked like this," he says. "But it has a tactile quality as well. People touch it—and then they want to lean their heads against it." A trellis made of ipe was designed to shade the interior from high summer sun; it’s one of several passive climate-control strategies employed by Dubbeldam. Along with a radiant heating system, they make the house extremely energy-efficient. Upstairs, an operable skylight lets hot air vent straight out of the house, and also brings light in to the adjacent bathroom—through a frosted glass wall—and the downstairs. Though Patel lives alone, he loves to entertain. In summer months, friends can gather at the outdoor table for some barbecue and have drinks on the sofa inside. Plantings of lavender, fragrant grasses, and a Japanese maple add colour in the carefully composed garden, which has a floor of tile and painted cedar slats.